Inserts and insert sites in transgenic, papaya ringspot virus (PRSV)-resistant commercial papaya Rainbow and SunUp, were characterized as part of a petition to Japan to allow import of fresh fruit of these cultivars from the U.S. and to provide data for a larger study aimed at understanding the global impact of DNA transformation on whole genome structure. 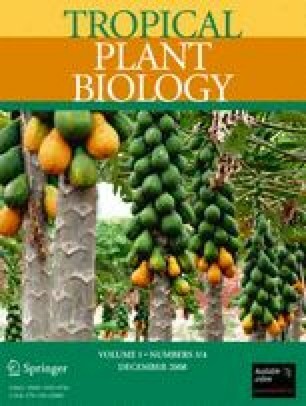 The number and types of inserts were determined by Southern analysis using probes spanning the entire transformation plasmid and their sequences determined from corresponding clones or sequence reads from the whole-genome shotgun (WGS) sequence of SunUp papaya. All the functional transgenes, coding for the PRSV coat protein (CP), neophosphotransferase (nptII) and β-glucuronidase (uidA) were found in a single 9,789 basepair (bp) insert. Only two other inserts, one consisting of a 290 bp nonfunctional fragment of the nptII gene and a 1,533 bp plasmid-derived fragment containing a nonfunctional 222 bp segment of the tetA gene were detected in Rainbow and SunUp. Detection of the same three inserts in samples representing transgenic generations five to eight (R5 to R8) suggests that the three inserts are stably inherited. Five out of the six genomic DNA segments flanking the three inserts were nuclear plastid sequences (nupts). From the biosafety standpoint, no changes to endogenous gene function based on sequence structure of the transformation plasmid DNA insertion sites could be determined and no allergenic or toxic proteins were predicted from analysis of the insertion site and flanking genomic DNA. FAO/WHO (2001) Evaluation of allergenicity of genetically modified foods. Report of a joint FAO/WHO expert consultation on allergenicity of foods derived from biotechnology. Available at: http://www.who.int/foodsafety/publications/biotech/en/ec_jan2001.pdf.